Don’t you want to know where your friends are at any given moment? Do you wish to keep a track on your family members especially when you are worried about their safety? Smartphones have made it very easy to track your friends and family in times of needs and emergency. There are many apps that help you keep a tab on the location of your family members as well as friends. Not just you tracking someone, your friends and family can also track you when you are on the move. Thus, making sure all are safe and extend help in case of emergencies. Of all the many apps available, we shall learn how you could track your friends using Google Latitude. Google Latitude was a web/mobile/social app developed by Google. It was a location-aware feature of Google Maps. Smartphones users could allow people they knew to view their current location via Latitude. Google Maps used their Google Account to create a map of their location. One could choose what others could see related to their location. Some people could see their exact location and in some cases they could accept someone’s request, but hide their location from them. You could also show just which city you are in currently or hide your location from certain people. And if you wish, you could remove any person from your list. Latitude also helped you create a blanket setting for all your contacts. You could allow Latitude to automatically detect your location or you could choose to enter it manually. Google has discontinued the Google Latitude app. They announced their plans to shut down Latitude on July 10, 2013. By August 9, 2013, Latitude was phased out completely. 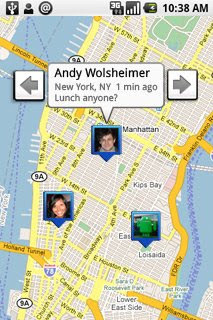 Try these apps as they will help you track friends better than Google Latitude.